Bologna, the capital of the Emilia-Romagna region, has one of the largest preserved historic centres of any Italian city. Its university is the oldest in Europe and there are many students in its population of about 400,000, making it the 7th largest city in Italy. It was European City of Culture in 2000, and retains clear evidence of the grid pattern established by the Romans, as well as many medieval and Renaissance buildings. The centre and its growing metropolitan area, set between Lombardy and the Po valley to the north, the Apennines and Tuscany to the south, is a hub for the Italian motorway and railway systems. It is thus well located for the development of its mechanical engineering, electronics, publishing and food industries. Bologna is a thriving modern city with much to offer the tourist and it can also act as a base for day trips by high speed rail to Milan, Venice and Florence, in contrast to the slow journey times in the days of Charles V.
When arriving in the centre of Bologna an immediate impact is made by the extensive arcades that line the major streets, providing shade in the summer and shelter when it is wet. Follow them to the Piazza Maggiore, the large square surrounded by Medieval and Renaissance buildings, an ideal starting point for any visit. On barmy summer evenings it hosts open air film screenings, in winter it can be covered with many feet of snow and in November it is the centre of a chocolate festival (Cioccoshow) – a space full of character and interest. 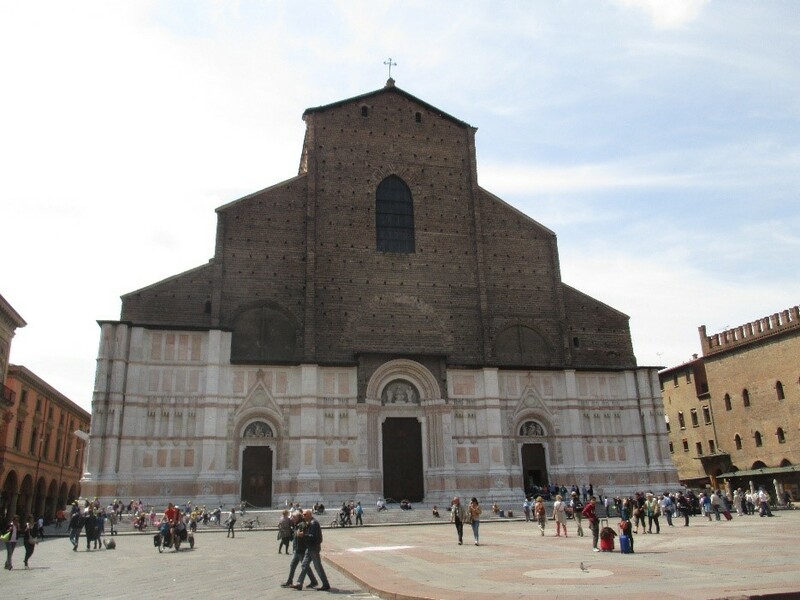 One side is almost filled with the unfinished facade of the Basilica of San Petronio (St Petronius) (Photo 1). The saint had been bishop of the city from 432 until his death in c.450. During the 12th century his legendary ‘life’ was written, becoming a very popular work, and in 1142 his relics were discovered. 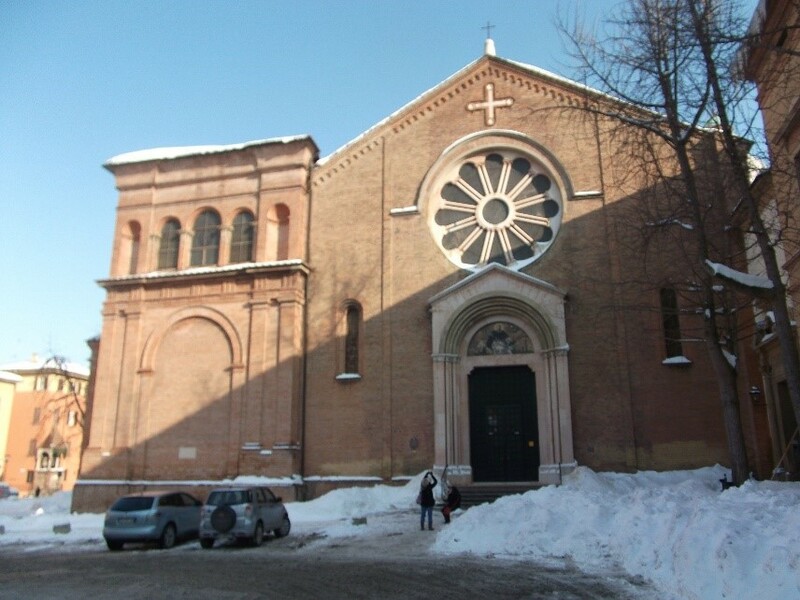 Immediately a church was constructed in his name in the centre of Bologna. In the late 14th century the city council wished to erect a much grander structure. (Photo 1) The Basilica of St. Petronius on the Piazza Maggiore. The church, whilst the largest in the city, indeed one of the largest in the world, is not the cathedral. It was the city’s project, not the bishop’s, and was only transferred to the diocese in 1929. The plans drawn up by Vittorio di Vincenzo were for a massive Gothic church and on 7th June 1390 the foundation stone laid. Construction work was slow and over time, as styles changed, new plans were considered and implemented. In 1514/15 a model of a new design was constructed by Arduino Arriguzzi, which can be seen in the Basilica museum. The scale of this church would have outdone even St. Peter’s, at the time under construction in Rome, and tradition has it that the Papacy made sure that the necessary funds did not become available. In 1530 it was the location for the coronation of Emperor Charles V by Pope Clement VII, the last occasion on which an emperor was crowned by the pope. Most of the art works are found in the numerous chapels, in the first of which (the Chapel of St. Abondio) Charles’ coronation took place in 1530. The urn containing the remains of St Petronius is in the altar of the second chapel. The Chapel of the Magi (Chapel IV – formerly the Bolognini family chapel) contains a Gothic altar-piece with 27 carved wooden figures painted by Jacopo di Paolo, and frescos of ‘The Journey and the Return of the Magi’, ‘Paradise’ and ‘Hell’, attributed to Giovanni da Modena. The Chapel of St. Sebastian (Chapel V) has the ‘Martyrdom of St. Sebastian’ by Lorenzo Costa, who was also responsible for the ‘Virgin and Child enthroned, with Saints James, Sebastian, George and Jerome’ found in Chapel VII (the Chapel of St James). Chapel XVIII (St Lorenzo) has a ‘Pieta’ by Amico Aspertini, who also designed the triumphal arches constructed for Charles’ entry to Bologna in November 1529. A number of images of St Petronio can be found – an inlay on the central stalls of the choir, a 15th century wooden statue between chapels 4 and 5, a painting in the Chapel of St. Peter Martyr (Chapel 13), and part of a tapestry in the museum. An item of note in the basilica is the famous meridian by Gian Domenico Cassini, professor of astronomy at the university. Replacing an earlier 16th century meridian by Egnazio Dante, who played a part in establishing the Gregorian calendar that we use today, it was constructed in 1655. He successfully calculated exactly where the gnomonic hole in the basilica wall should be so that the sun’s rays would not be blocked by a column. At 66.71 m. it is the longest meridian line in the world and measurements made from it played a role in the debate between the geocentric (earth at the centre) and heliocentric (sun at the centre) systems. Photo 2 The Palazzo Comunale(Palazzo d’Accursio) – on the right – and the Piazza Maggiore. The nearby Palazzo Comunale (Palazzo d’Accursio), (Photo 2) originally 13th century and added to in the 14th and 15th centuries, was the seat of government in Bologna for well over 600 years, whether it be the city council or the papal legates. A bronze statue of Pope Gregory XIII (from the Bolognese Boncompagni family) stands over the entrance and in the courtyard is a large plaque erected in November 1530 to commemorate the meetings of Charles with Pope Clement VII over a period of over three months and his coronation as emperor in 1530. Home to the papal legates for 300 years, the building includes the ceremonial Farnese Hall (formerly the Royal Hall), and the adjacent Farnese Chapel, where the Emperor prepared for his coronation, which has the fresco cycle ‘Stories of the Virgin’s Life’ (1562) by Prospero Fontana, the leading Mannerist painter, commissioned by Cardinal Carlo Borromeo, Pope Pius IV’s legate. In addition the palazzo contains the Hercules Hall, the Red Hall and the City Council Hall (formerly the Senate Gallery). The first floor also houses the municipal art gallery, which has a model of Bologna in the 13th century with its multitude of towers, and art works ranging mainly from the 13th to the 18th centuries, and the Morandi Museum, showcasing the work of Giorgio Morandi (1890-1964). In the adjacent Biblioteca Salaborsa, the old stock exchange is now home to the new multimedia city library and hosts numerous exhibitions. Opposite, across the Piazza del Nettuno, with its bronze fountain of Neptune (1563), are the Palazzo del Podesta, with its early 13th century Arengo Tower, and the Palazzo Re Enzo (Photos 3 and 4) built in 1245 - both closed except for exhibitions. Originally the New Palace, the latter takes its name from the son of Emperor Frederick II, Enzo, who was captured in battle in 1249 and held as prisoner in the palace for 22 years until his death. 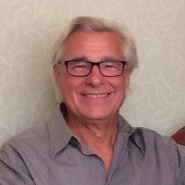 His imprisonment was not too restrictive, being able to enjoy women, wine and poetry. He is said to have had at least three daughters and a son, called Bentivolgio, by a peasant girl, Lucia, his name coming from the words he supposedly whispered to her ‘Amore mio, ben ti voglio’ (My love, I am fond of you). The legend has it that the boy was the ancestor of the family that later controlled the city in the 15th century. Photo 3. The Palazzo del Podesta and the Palazzo Re Enzo facing the Piazza Maggiore – at night. Photo 4. The Palazzo del Podesta and the Palazzo Re Enzo facing the Piazza Maggiore – during the day. Also facing onto Piazza Maggiore is the Palazzo dei Banchi, first built in 1412, but rebuilt by Giacomo Barozzi (aka Vignola) in the 1560s, so named because it is the area where the money lenders set up their benches (banchi) for business. The area behind the palazzo was an important market area. A striking portico (Il Pavaglione) links the palazzo to the Archiginnasio, also built in the 1560’s to bring the various faculties of the university together. It remained the main university building until 1803 (when this role was moved to the Palazzo Poggi) and well worth visiting to see the remarkable old library and the anatomical theatre (Photos 5 and 6) built in 1637. Photo 5. 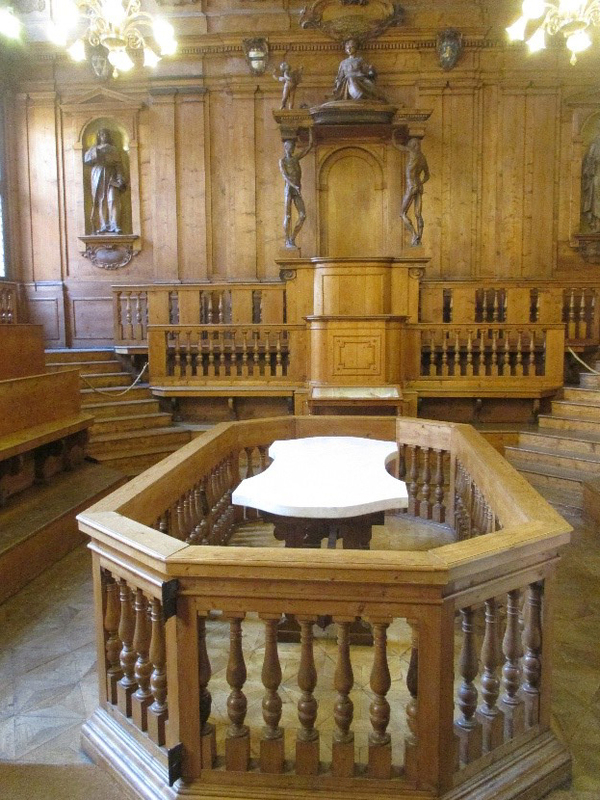 The anatomical theatre in the old university. Photo 6. The library in the old university. A short way along the Via Rizzoli are the early 12th century Due Torri (Two Towers) (Photo 7), two of the up to one hundred and eighty such towers that existed in Bologna by the end of the 13th century. The Torre della Garisenda (47m.) leans alarmingly and is closed to the public, but it is possible to climb the taller Torre degli Asinelli (97m.- 498 steps) to get a fine view of the city and its surrounding area. Photo 7. The Asinelli Tower built in the 12th century. Near the Due Torri is the Ghetto Ebraico (Jewish Ghetto). In the Middle Ages Jews had been a respected group in the community. In 1555 the ghetto was established during the papacy of the notoriously intolerant Paul IV (1555-1559) to segregate the Jews and to restrict them to money lending and medicine. The area is characterised by narrow streets and alleyways, street names such as Via dell’Inferno, doors with spy holes, and has the Museo Ebraico which looks at the history of Jews in Bologna up to the present day. Just to the north of the Jewish Ghetto it is possible to see one of the few remaining canals from the network that was constructed in the 12th century with water diverted from the River Reno. These were used for transport, water and sanitation, and for the textiles mills. One section of a canal is visible from bridges on Via Piella and Via Alessandrini, near Basilica di San Martino. Photo 8. 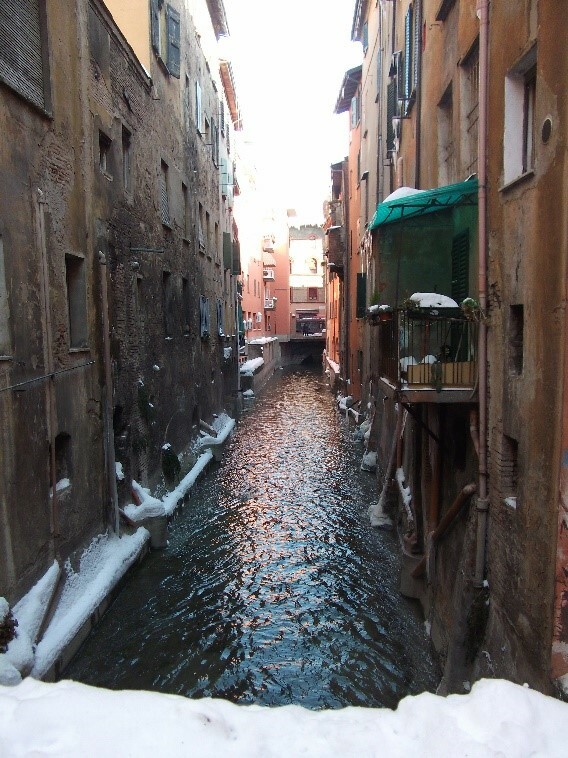 One of the few remaining sections of the old canals of Bologna. A short walk takes you to the photogenic cobbled Piazza Santo Stefano (Photo 9), from which there is access to the oldest places of worship in the city. The first church here may have been built by St. Petronius as early as the 5th century over an earlier pagan temple. Others were constructed from the 8th century onwards and at one time there were 7 churches on the site, although now only 4 remain (collectively known as the Abbazia di Santo Stefano), dating mainly from the 11th and 12th centuries, though some older sections have survived. 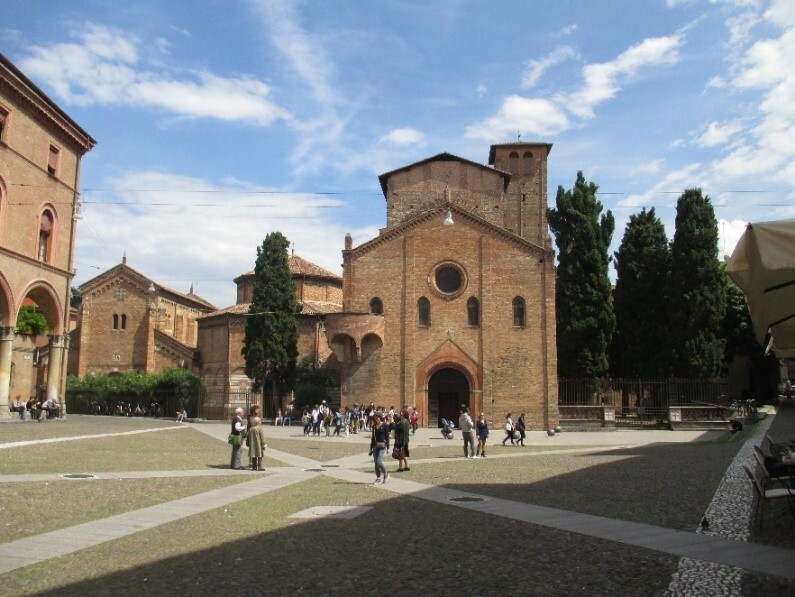 Photo 9 The Abbazia di Santo Stefano in Piazza Santo Stefano – the site of the oldest churches in Bologna. The church of St John the Baptist (church of the Crucifix) impresses with its simplicity, and leads to the unusual and atmospheric church of the Holy Sepulchre, with its central temple modelled on the shrine of the Holy Sepulchre in Jerusalem. Until 2000 this contained the remains of St. Petronius. 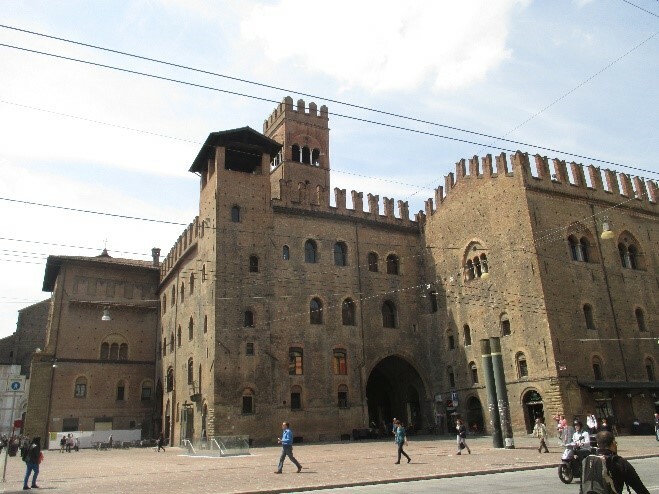 Outside, the 13th century Pilatus court, with its plaques commemorating Bologna’s war dead, is named for the basin of the fountain, once believed to be that used by Pontius Pilate to wash his hands of his responsibility for the death of Jesus. The church of San Vitale ed Agricola, named after a Roman citizen from Bologna (Agricola) and his slave (Vitale) martyred in 304, and the church of the Holy Trinity make up the rest of this complex. San Giacomo Maggiore originated as a monastic church of the Augustinian order, built mainly between 1267 and 1315 in Romanesque and early Gothic style. The Bentivoglio family had the interior renovated, raised the bell tower and added an extensive exterior portico during the time of Giovanni II in the second half of the 15th century. The family chapel, bought by Annibale I in 1445, was re-consecrated in 1487 in thanksgiving by Giovanni II for his family’s escape from an attempted massacre by the Malvezzi family (who also have a chapel in the church). He commissioned paintings from Lorenzo Costa, and his ‘Madonna and Child Enthroned’, the ‘Triumph of Death’, and the ‘Triumph of Fame’ have resulted in a most impressive chapel. Family members are painted into these scenes - to either side of and just below the seated Madonna and Child are Giovanni II and his wife Ginevra Sforza, while below them are their eleven children. The chapel also has a painted wooden monument to Annibale I Bentivoglio, murdered in 1445 and nearby is the tomb of his father Anton Galazzo Bentivoglio, executed in 1435. Giovanni II also commissioned the cycle of frescos (1505-06) in the small neighbouring church, the Oratory of St Cecilia. The 10 paintings (five on either side of the oratory) recount the story of St Cecilia’s life from her marriage to Valerian through to her martyrdom. Although not all the attributions are certain, most were painted by Lorenzo Costa (Scenes 2 and 9), Francesco Francia (Scenes 1 and 10) and Amico Aspertini (Scenes 5 and 6, with a strong likelihood of 3 and 7). Another significant church in Bologna is the Basilica di San Domenico (Photos 10 and 11). Dominic Guzman, the founder of the Order of Preachers (Dominican Order), arrived in the city in 1218 and the first two General Chapters of the order were held at the church of San Nicolo of the Vineyards on the edge of the city in 1220 and 1221. On Guzman’s death in 1221 his body was initially placed behind the alter of San Nicolo, and then in its own sarcophagus, but as the church was rebuilt on a larger scale and the number of pilgrims visiting the tomb increased rapidly a new, raised, shrine was created in 1264-67. The Arca di San Domenico, originally by Nicola Pisano and Arnolfo Cambio, has been added to over the centuries, particularly the elaborate crowning between 1469 and 1473 by Niccolo d’Apulia, known as Nicolo dell’ Arca after his work here. The candlestick-holding angel to the right of the altar is believed to be by the young Michelangelo in 1494, four years before he started work on the exquisite ‘Pieta’ in St Peter’s Basilica, Rome. The church also contains many other art works, including the mid-13th century painting ‘Crucifix’ by Giunta Pisano in the chapel of St Michael the Archangel, the 102 wooden choir stalls (1528-30) by Fra Damiano of Bergamo, and paintings of leading artists of the Bologna school – Carracci, Reni, Domenichino, Cesi. Outside the church, in the broad, cobbled square, are two columns, of San Domenico (1627), and the Madonna of the Rosary (1632 – to commemorate the end of an epidemic of the plague), and the raised tombs of Egidio Foscarari (1289) and Rolandino de’ Passeggeri (1305). The 14th century Gothic Basilica di Santa Maria dei Servi is unusual in that it has an arcaded courtyard in front, once common in early churches but most have disappeared. Inside the 100 metre long church there are traces of frescos by Vitale da Bologna, and the precious Holy Virgin Enthroned by Cimabue (1240-1302) the early Italian master, as well as many 17th century Bolognese paintings. Photo 10. Basilica of San Domenico. 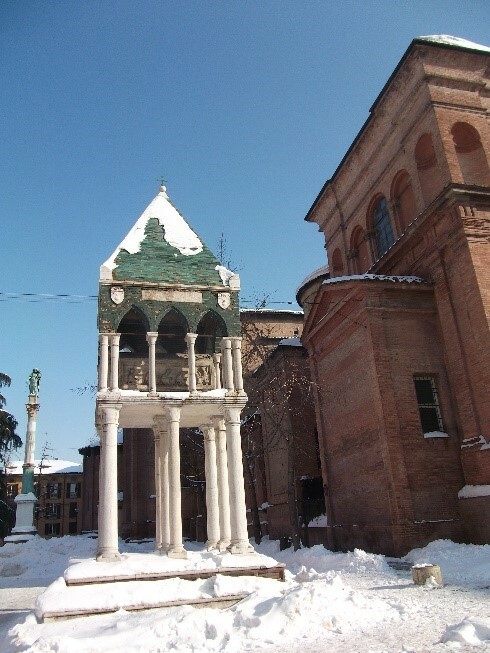 One of the raised tombs in the adjacent square – in a snowy February (2012). Photo 11. The front of the Basilica of San Domenico (2012). In 2012 a new History of the City of Bologna Museum was opened in the Palazzo Pepoli on Via Castiglione. The 34 rooms cover Bologna’s past from pre-Etruscan times up to the present-day, looking at politics, art, music, science, and industry, set in a chronological framework, with a variety of multimedia installations. Room 13 focuses on the coronation of Charles V. Other museums include the National Picture Gallery (Pinacoteca Nazionale di Bologna), the Gallery of Modern Art of Bologna (MAMbo), the Archaeological Museum, and the Lamborghini Museum. On the edge of the city there are the substantial remains of a number of gates in the medieval walls, such as the Porta Saragozza in the south-west. From here the Portico di San Luca runs for over 4 kms. to the sanctuary of the Madonna di San Luca on the Colle della Guardia, 300 m. above the city. The portico, with 666 arches, built between 1674 and 1793, is the longest continuous arcade in the world. Each year there is a procession from the centre of Bologna to the sanctuary along the portico. If walking the whole distance along the Portico di San Luca is not for you, then it is certainly possible to enjoy Bologna by strolling along the arcades nearer the centre enjoying the temptations of the cafes, shops and restaurants that line the streets, between visiting the superb buildings and churches that are so frequent in this busy city. The earliest settlement in the area is believed to stretch back about 3000 years, and the city was developed by the Etruscans (as Felsina) and then the Boii, a Celtic tribe from Transalpine Gaul, (as Bona) before coming under Roman control after the Battle of Telamon in 225 B.C. During the 2nd Punic War (218 B.C.-203 B.C.) the Boii sided with Hannibal during his invasion of Italy and eventually suffered defeat and complete subjugation by the Romans, who established Bonania as a ‘colonia’ in 189 B.C. Bonania was to be an important settlement on the Via Aemilia from Rimini to Piacenza constructed in 187 B.C. Evidence of this major route can still be seen running through the city, as Strada Maggiore, Via Rizzoli, Via Ugo Bassi, and Via Felice. Bonania grew to be second only to Rome in Italy, though suffering in the later stages of the Empire as the Vandals and Goths invaded. Petronius, the son of a Roman prefect in Gaul, became Bishop of Bologna in 432, restoring churches destroyed during the invasions. He also started construction of the church of San Stefano based on what he had seen on a visit to the Holy Sepulchre in Jerusalem. 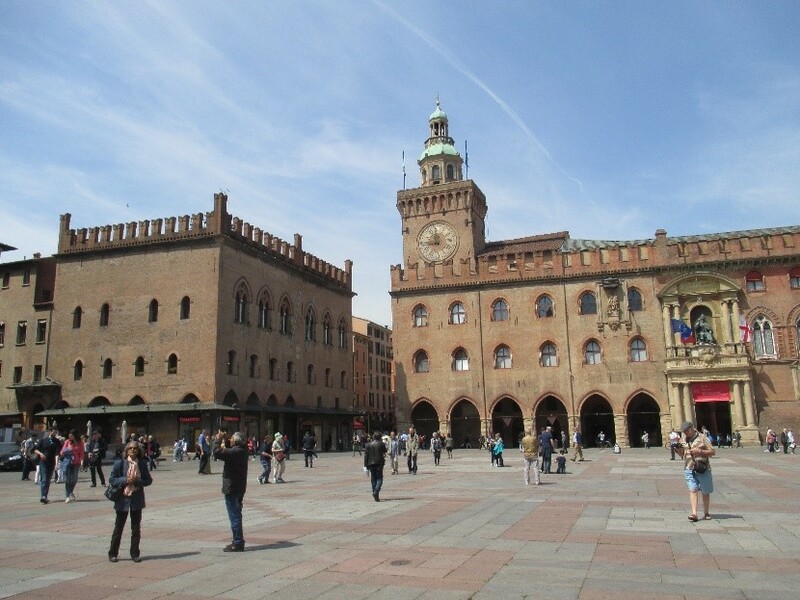 Bologna was captured by the Lombards in 728 and then by Charlemagne in 774, who handed the city over to Pope Adrian I. The papacy was to have a major influence in the history of Bologna for the next 1000 years. 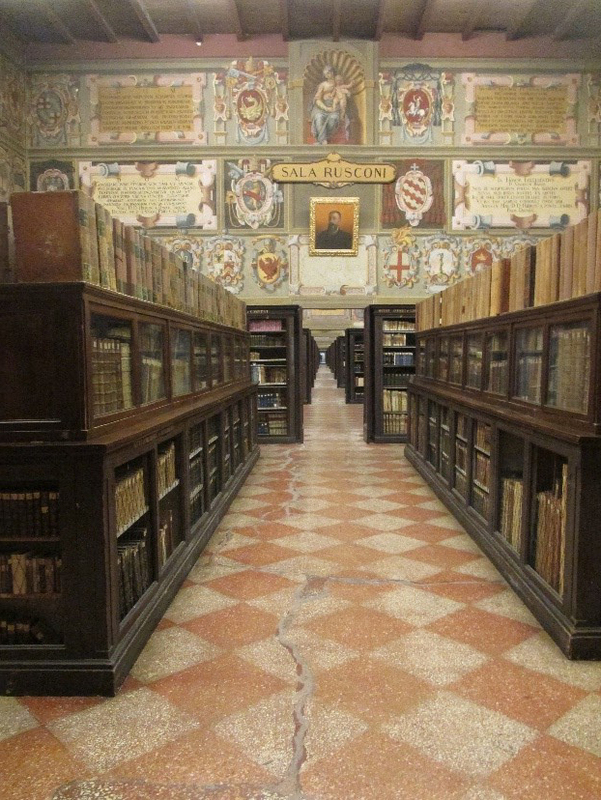 Having founded the first university in Europe in 1088, Bologna became a free commune in the early 12th century. Although involved in the on-going conflict between the Papacy and the Emperor which bedevilled northern Italian cities for centuries, the next 200 years saw its rapid growth in size and wealth, especially after the Peace of Venice (1177) and the Peace of Constance (1183) between Emperor Frederick Barbarossa, the Papacy and the northern Italian cities of the Lombard League. These granted the city a significant degree of autonomy. 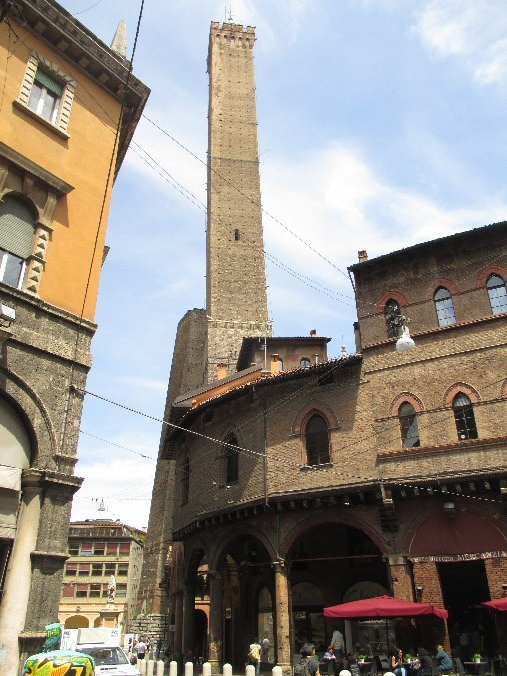 It was during the 12th and 13th centuries that the towers for which Bologna was once renowned were constructed, whether for defence or as a symbol of status of the families, churches and abbeys who built them is unclear. In 1256 the city passed the so called ‘Paradise Laws’, ending feudal serfdom and granting freedom to slaves. New walls were also constructed to incorporate the expanding urban area. Trade and industry, particularly textiles, flourished during this period, with transport facilitated by the creation of numerous canals that have now all but disappeared. By 1300 Bologna had a population of over 50,000, making it the 5th largest city in Europe after Cordoba, Paris, Venice and its neighbour Florence. It was never again to reach such prominence. In the 14th century problems included internal conflicts between rival families, linked to the rivalry between the Guelph (Papal) and Ghibelline (Imperial) factions widespread at the time, conflict with nearby Modena and the Visconti of Milan, and the depredations of the Black Death. A number of families rose to prominence, especially the Pepoli (14th century) and the Bentivoglio, who dominated the city for much of the 15th century under Sante (ruler as ‘signore’ 1442-1462) and Giovanni II (ruler 1462-1506). In 1506 the troops of Pope Julius II removed Giovanni from power and set up a Papal Legate as ruler in the name of the Papacy, along with a Gonfaloniere and consuls elected by a Senate, although their real power was severely restricted. The legates ruled from the Palazzo Comunale, which had been the seat of city government since the 14th century, overlooking Piazza Maggiore. It was in November 1529 that Emperor Charles V came to the papal city of Bologna for lengthy negotiations with Pope Clement VII, to arrange his coronation and settle the political affairs of Italy (See more details in 'Charles V: Duty and Dynasty - The Emperor and his Changing World'). As talks dragged on, the need for him to move north of the Alps to meet his brother Ferdinand to deal with the threats of the Ottomans and the Protestants became more urgent. Charles had originally intended that he would be crowned in Rome but it was now decided that the ceremony would take place in Bologna. 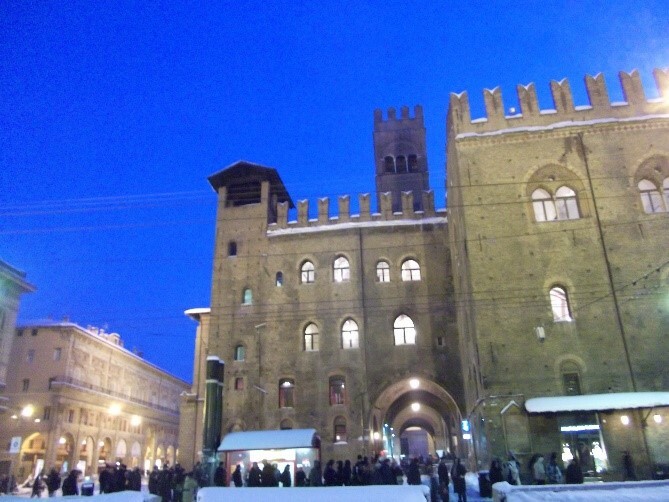 Thus on his 30th birthday, 24th February 1530, Charles’ magnificent procession arrived in the Piazza Maggiore outside the unfinished church of St Petronius. He entered and in the first chapel on the left hand side of the church (as one enters) he received the Imperial crown, the last such coronation to be carried out by a Pope. Charles thus achieved what had been one of his dearest wishes for more than a decade, the ultimate symbol of the unity of church and state, secular and religious authority, though by then his experiences must have made him aware that real unity, though desirable, was probably unobtainable. This period, as in the rest of Italy, was a period of great creativity in art and architecture. Work had started on the Basilica of St Petronius (San Petronio) in 1390 but not finished until 1670; the facade was never completed. Most of the buildings around Piazza Maggiore in central Bologna already existed – Palazzo del Podesta, Palazzo Re Enzo (13th C), Palazzo Comunale, (13th C), Palazzo dei Notai (14th C) and Palazzo dei Banchi (early 15th C) – but many were refurbished or extended, often with new facades and portals in the 16th century. In painting, the work of Amico Aspertini (1474-1552) and Prospero Fontana (1512-1597) was developed by Ludovico Carracci (1555-1619) and his cousins Agostino (1557-1602) and Annibale (1560-1609) in the Accademia degli Incamminati (‘of those opening a new way’). Later Baroque artists of the school included Guido Reni (1575-1642), Domenichino (1581-1641), and Guercino (Giovanni Francesco Barbieri)(1591-1666). Work of the Bolognese School can be found throughout the city and more widely across Italy, though in recent years it has been compared unfavourably to that of Caravaggio, a contemporary of the Carracci cousins. For nearly 300 years the Papal Legates continued to rule the city until it was taken by Napoleon in 1796, though it reverted to the Papacy after his defeat. After considerable upheaval in the first half of the 19th century, with rebellions and Austrian occupation, Bologna became part of the newly created Kingdom of Italy in 1860. Rome, Milan and Naples may have been the major cities of the new state, but Bologna developed its role as a centre of learning, industry and transportation. Given its strategic significance it became the target of considerable allied bombing during the Second World War. Major raids on 16th July 1943 and 25th September 1943 caused much loss of life and destruction of property. For over 50 years after the war Bologna was well known as a city with a left wing local council, a fact that may have contributed to making it the target of a major neo-fascist terrorist attack in 1980, when an explosion at the railway station killed 85, and injured another 200 people. Today it is a city with much to offer visitors, particularly those interested in the history of medieval and Renaissance Italy. Bologna is also renowned for the quality of its food. With its rich, fertile surrounding area, the city is traditionally known for pork, and claims to have created Tortellini and Tagliatelle Ragu. Good restaurants can be found to match all purses. Walking under some of the almost 40 kilometres of porticos that line so many of the streets, sheltered from sun, wind or snow, it is possible to imagine the lives of those who worked, celebrated, suffered, and died in those same streets hundreds of years before.